Presenting delicate and unmistakable fragrances by Forest Essentials.Forest Essentials Parfum Intense comes in three uniquely compelling variants that celebrate the beauty, poise and integral elegance of women who are all perfect in their own right.Used as core scents in perfumery around the world, the flowers bloom in eclectic forms and contexts with their own story to tell. Each wearer experiences the flower differently, with a journey of her own. Situated on the historical scent trade route that brought perfumes from India to the Middle East, a small town on the banks of the Ganges, Kannauj, came to be known as the Perfume Capital of India.Desi Gulab is also known as 'Taruni ' in Ayurveda which means 'unimaginably beautiful'.The freshest flowers of the voluptuous Rose is steam distilled for its pure essential oils. 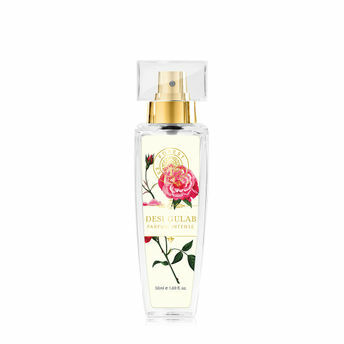 The long lasting, seductive floral fragrance of this perfume leaves a calming and harmonious effect on the senses. Explore the entire range of Perfumes (EDT & EDP) available on Nykaa. Shop more Forest Essentials products here.You can browse through the complete world of Forest Essentials Perfumes (EDT & EDP) .